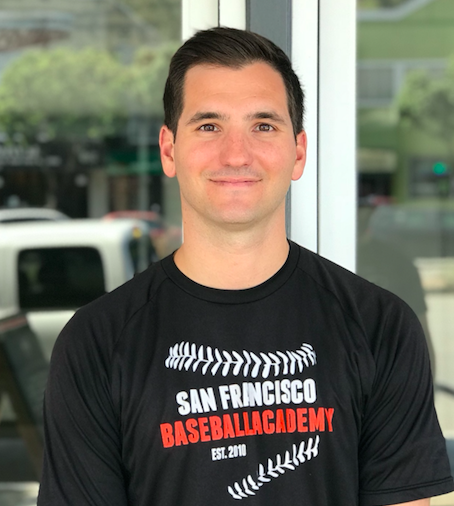 Coach Michael is a third generation San Francisco native (North Beach) and the founder of the San Francisco Baseball Academy. Coach Mike played baseball and basketball at Sacred Heart High School and later played baseball at College of San Mateo and Skyline Junior College. Coach Michael's hard work at Skyline led to a baseball scholarship to St. John’s University where he and his teammates were ranked in the top 20 in the country both years he was there. Michael and his team are working to Bring Baseball Back to The City, one player at a time. Coach Travis is a Bay Area Native —born and raised in Novato— who has spent his life coaching and mentoring young athletes. Coach Travis played baseball and football at Novato high school as well as at the College of Marin, leading his team to multiple championships. Travis has led camps and travel teams for the Junior Dons program in San Francisco as well as serving as the graduate assistant at UC Santa Barbara. Coach Andrew is born and raised in The City in the Richmond district where he still lives today. Andrew attended Burlingame High School where he was an All-County athlete in Baseball and Football. He played baseball at College of San Mateo, leading them to a state championship appearance in 2010, where a scholarship followed to San Francisco State University. Coach Andrew has been assisting the Washington High School program for 6 seasons and has 2 dogs named Griffey and Jeter. Coach Richie was born in the Bay Area and raised in St. Louis a die hard Cardinals fan. He started playing baseball at the age of 4 and was a three sport athlete (Baseball, Basketball and Football) at Eureka High School. He went on to play baseball at Laney College in Oakland where he was a standout 2 way player, known for his big arm and rangy defense. Richie began coaching youth baseball shortly after and has coached for the USSSA All American summer team for the past 2 years. His passion, competitiveness and love for the game have been a great addition to the SFBA. Coach Aritz is a native of Pamplona, Spain. After moving to the U.S. at the age of 18 he played two years in junior college where he landed scholarship which took him to the University of San Francisco. Following his collegiate career, Aritz played professionally in his native Spain and logged 2 years in independent ball with the Rockford Aviators of the Frontier League and the Sonoma Stompers of the Pacific Association. Then traveling to Japan for the Ehime Mandarin Pirates of the Shikoku Island League. Before joining the SFBA, Coach Aritz spent 3 years on the coaching staff of his alma matter, USF and their Junior Dons. Hailing from the Central Valley, in high school Emily played softball and was an All-Conference #1 singles tennis player. When not found at the front desk, Emily is found in the library hitting the books on track to be the first of her family to graduate a 4 year university.